Toru Goto’s persistent legal fight for freedom of faith finally bears results. In the first trial ruling of January last, the Tokyo District Court had ordered the three defendant members of the family to pay 4.83 million yen in damages, and Mr. Miyamura was to jointly pay 960,000 yen. The charges against Mr. Matsunaga and the Japan Alliance Christ Church to which he belongs had then been dismissed. Both the plaintiffs and the defendants had appealed this ruling. In 1986, Mr. Goto, then 23, became a member of the Unification Church. In 1987, there was a first attempt of kidnapping and confinement by his father and other relatives but he managed to escape about a month later. In order to avoid another similar experience, he cut off all the links with his family. Eight years later, in September 1995, the parents of the plaintiff, his elder brother and wife, and younger sister, kidnapped him from their home in Hoya City, Tokyo (currently West Tokyo City) according to instructions from deprogrammer Takashi Miyamura and Yasutomo Matsunaga, a Christian minister. He was then confined in an apartment in Niigata City for approximately one year and nine months. Matsunaga came to this apartment to urge him to leave the Church. In June of 1997, the plaintiff was taken to a first apartment in Ogikubo (Tokyo) where he was confined for five months. Then, he was transferred to another apartment (Flower Home) in Ogikubo where he was detained for about ten years, Miyamura regularly visited this last confinement site together with former members of the Unification Church (UC) in order to convince him to leave the Church. During his confinement, Mr. Goto attempted to escape several times but he was every time caught and held by his family members. Even when he had influenza and developed a high fever, he was not allowed to visit a clinic. Fearing that he would not be released from his long-term confinement in his lifetime, Mr. Goto held three hunger strikes of 21 days, 21 days, and 30 days. Around November 2007, it looked like the family members had started arguing about whether to go on with the confinement or not due to the financial burdens it imposed. On 10 February 2008, at around 4:00 PM, his brother, his sister-in-law, his mother and his sister suddenly ordered him to leave the apartment. He was then emaciated and suffering from a serious state of starvation. Dressed in his lounge wear, he was thrown down on the concrete corridor in front of the entrance door without any belongings or ID document. On his way to the Unification Church headquarters, he came across a member of his church who gave him some money so that he could take a taxi to reach a safe haven. That evening, he was diagnosed with malnutrition and admitted to a hospital. For a while, he could barely stand on his feet. “I can never pardon their actions. They deprived me of my fundamental human dignity as well as the most precious period of my life. Yet, my family members and Miyamura have not yet shown any remorse or offered an apology. Miyamura even tried to divert the blame from himself by saying that he never knew that the entrance door of the Ogikubo Flower Home was padlocked,” he said to Human Rights Without Frontiers in 2011. In April 2008, Mr. Goto submitted a criminal complaint to the Ogikubo Police Station. However, the police did not conduct any serious criminal investigation and turned the case over to the Tokyo District Public Prosecutors Office in February 2009. On 9 December 2009, the prosecution decided to waive the indictment of the criminal complaint on the grounds of insufficient evidence. On 23 June 2010, Mr. Goto appealed to the Tokyo Committee for the Inquest of Prosecution with the hope of reopening the criminal case. On 6 October 2010, Mr. Goto’s appeal was rejected by the Tokyo Committee for the Inquest of Prosecution on the ground that there were too many doubts to consider the case as an attempt of compulsion, capture, confinement and injury. On 31 January 2011, he filed a civil lawsuit against his family members and the deprogrammers. We can commend to an extent the fact that the ruling recognized the liability of my brother and sister and the defendant Miyamura. However, I regret very much that the responsibility of the defendant Matsunaga was not recognized. 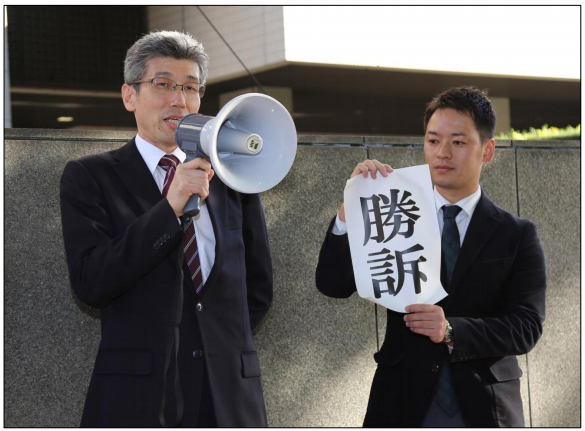 In particular, we highly appreciate the fact that the liability of the deprogrammer defendant Miyamura was recognized. When we think about the numerous Unification Church members who were kidnapped, confined and suffered under the instructions of defendant Miyamura, I believe that they would also be happy. Kidnapping and confinement, forcible conversion continues. My heartfelt wish is that the victory this time will be of help in eradicating kidnapping, confinement and forcible conversion. In 2013, the U.S. Commission on International Religious Freedom cited Japan’s judicial system for turning a blind eye to the kidnapping and forced deprogramming of people in the Unification Church and other “new religious movements” over the past several decades. See here). Human Rights Without Frontiers interviewed victims of deprogramming attempts of two new religious movements in Tokyo in 2011 and published a general report about the global issue entitled “Abduction and Deprivation of Freedom for the Purpose of Religious De-conversion” and available on Amazon. In July 2013, Human Rights Without Frontiers’ (HRWF) submitted a report, entitled Japan: Abductions and confinement for the purpose of religious de-conversion (Violations of Articles 7, 9, 12, 18, 23 and 26 of the ICCPR) to the Human Rights Committee in order to bring to the attention of Committee members its concerns about the total impunity of non-state actors who abducted and confined converts to new religious movements until they recanted their new religious faith. See text of the submission here. On 14 November 2013, the problem was raised by the Human Rights Committee in its list of issues addressed to Japan (See here). In its reply, the Japanese government flatly denied the existence of such an issue, merely stating “We do not know of any cases as those described” although on 28 January 2014, a Japanese man, Toru Goto, who had been kidnapped by family members, confined for 12 years (from September 1995 to February 2008) and subjected to violent attempts to force him to renounce his new religious affiliation, won a court ruling against his captors and the deprogrammer in a civil lawsuit. On 15-16 July 2014, Japan’s human rights record was reviewed in the framework of the 111th session of the United Nations Human Rights Committee. During Japan’s sixth periodic review, the right to freedom of religion or belief and the right not to be coerced to change religion was raised in detailed reports provided to the Committee by Human Rights Without Frontiers (Brussels) and by the Japanese Association of Victims of Abduction and Forced Religious De-Conversion. During the review, the German expert of the Committee, Ms. Seibert-Fohr, raised the issue of abductions and so-called “deprogramming” as she said. She explained that the Committee came to know about cases of abductions and forced religious de-conversions of members of the Unification Church and Jehovah’s Witnesses, that adults were abducted and confined by their families for up to six months or more, and that there was a lack of investigation and police search, under the justification that they were “with their families”. She explained that civil cases were brought but no injunction had been pronounced to her knowledge. She asked the Japanese government which steps it was going to take to remedy this situation. For decades, Japanese authorities have turned a deaf ear to the complaints of numerous victims of abduction, confinement and attempts of change of religion under physical and psychological coercion. For decades, Japanese police have protected the perpetrators from prosecution letting such crimes continue and thus violating the victims’ human rights. On 30 June 2013, the Japanese Association of Victims of Abduction and Forced Religious De-Conversion submitted a detailed report on the abuses. On 14 November 2013, the problem was raised by the Human Rights Committee in its list of issues addressed to Japan. In June 2014, Human Rights Without Frontiers provided the members of the Human Rights Committee with updated information on important recent developments concerning the issue of abductions and confinement for the purpose of forceful religious de-conversion in Japan. This report was also a reaction to Japan’s response to Question No. 16 (section on “Freedom of religion, opinion and expression (arts. 18 and 19)”) of the Human Rights Committee’s List of issues, which in HRWF’s view demonstrated the authorities’ failure to acknowledge that the human rights of abducted members of new religious movement are poorly protected in Japan. The Japanese Association of Victims of Abduction and Forced Religious De-Conversion also reacted to Tokyo’s denial of any problem by sending an updated and detailed answer to the Japanese government’s reply to the UN Human Rights Committee. HRWF believes that the Concluding Observations by the UN Human Rights Committee can play an important role in conveying to the authorities a strong message: abductions, confinement and attempted forced change of religion constitute human rights violations and the lack of appropriate action by police and impunity of the perpetrators cannot be tolerated. Effective measures have to be taken by the Japanese government to ensure the right of believers are fully respected. FOREF Europe congratulates Toru Goto on this important victory in the fight for freedom of faith in Japan! This entry was posted in Uncategorized and tagged freedom of belief, HRWF, Human Rights, Japan, Kidnapping, Takashi Miyamura, tokyo high court, toru goto, Yasutomo Matsunaga. Bookmark the permalink. 2 Responses to JAPAN: A landmark court decision!